If I could, I would spend all of my time making jewelry and writing. I’ve spent most of my adult life pursuing a professional career in writing; this year will be my last in completing my Bachelors in Journalism. Though I’d love to spend my days making fabulous jewelry creations, I understand the importance of finishing my degree. Jewelry is taking a bit of a back seat for the moment, but fret not – my jewelry creation will be in full gear after I walk across that pretty stage in an oversized green gown. In the meantime, I’ve been a busy, busy bee. Some super awesome things have happened in the last few months, so I decided to share ‘em with you! I’ve had some articles published online for Patch.com. But, it’s been years since I’ve seen my words in print. So, it was pretty neat when I recently got the opportunity to publish two articles in the university newspaper: New store promotes Michigan-made artwork about a creative shop in Eastern Market and Changing Detroit, one startup at a time featuring an impressive young Detroiter. I hope to continue working with the school newspaper; it’s great experience for future jobs. For the last 20 months, I’ve been working at technology agency based out of Troy: Core3 Solutions. The company does a brilliant combination of web design, development, marketing and IT services. I’ve had the opportunity to learn the basics of digital marketing and meet some really rad folks. 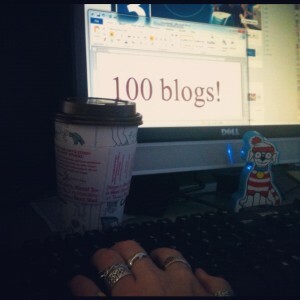 I just published my 100th blog on the company’s website. I get paid to blog and learn things; how incredibly cool is that? Journalism is transforming with the new importance in social media. A big advantage to this transition is the opportunity to connect with people you may not otherwise meet. I love writing about fantastically inspirational folks and events in this area; social media has made that possible in many situations. Tweeting, Facebook messaging and “liking” businesses has introduced me to some fantastic people and I thank them for letting me write about them, their projects and their businesses. I thank y’all for your continued support. Even with my busy schedule, I’ve been very fortunate to continue selling at Whimsy in Royal Oak and on etsy. Check ‘em out and “like” me on Facebook! Have an awesome day, friends.